It pays to keep your Nuke script tidy so get in the habit of using more dots and backdrop! As usual, copy and paste the following codes into the node graph to see it in action. label "Dot is useful to keep your script\ntidy and also Backdrop to label\nselective nodes of it's functions." label "You can change the\ncolour/size of the\ntext and backdrop.\n\nAnd font too!" 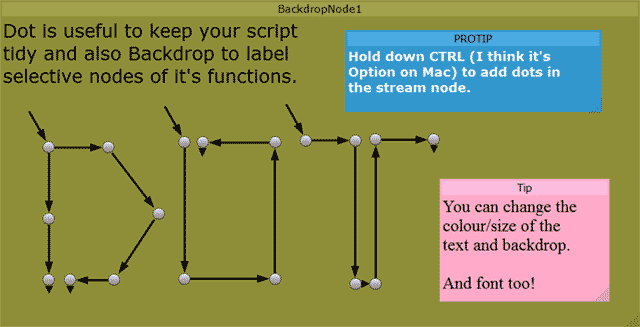 label "Hold down CTRL (I think it's \nOption on Mac) to add dots in\nthe stream node."